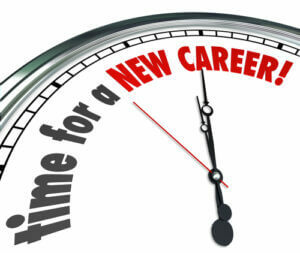 Time for a New Career words on a clock face follow your dreams and change jobs. Photo courtesy of Shutterstock. Although the economy has been picking up for a while, most students will still work at a starter job or transition job prior to moving on to a career in their fields. This may be an internship (with internship wages), a second job to help pay off student loans, or a full-time professional job within or outside of the student’s chosen field. Initially, most recent graduates are excited to be fully employed and be able to live independently while still paying all those bills on time. However, after a period of time (usually anywhere from six months to two years), graduates want to actively seek work in their fields and only in their fields. This presents a new set of challenges for employees who want to weigh the risk versus benefits of leaving the comfort of their current full-time jobs to delve into the fields they’ve always intended to work in. However, there are several ways recent graduates can make a smooth transition into the workforce and give themselves a chance to succeed. It’s generally a good idea to keep your current job and your job search independent. Although internships usually last only a short period of time, other employers may be concerned if they think an employee is considering leaving. Discretion is the key, and it’s a good idea to discuss any potential career moves only with people outside of your work environment. After securing new employment, give appropriate notice to your current employer to maintain professional courtesy and a good referral network with your soon-to-be old employer. It’s also a good idea to search within your social network of recent alumni. If former classmates have procured employment in the field you’re interested in, ask if they might be willing to make an introduction. Some people will allow a friend to use them as a reference, or even write a letter of recommendation. Alternatively, if they are not familiar enough with your current work achievements, they may be willing to set up an informational meeting with somebody in the company. It’s also a good idea to talk with other alumni about how they gained employment in the field you’re interested in. Is there a specific company that hires new grads? Did they use connections? Are there one or two skills that were particularly important to demonstrate? Recent graduates looking to transition should also consider how big of a transition they’re willing to make. It might be possible to start working at that dream job, but only if you move across the country. Additionally, some companies may require extensive travel or long hours depending on the field. Stop and think about how big of a change you want to make before starting the transition. Although it’s generally a good idea to keep work and a job search separate, sometimes companies will promote within. If you’re currently working in an entry level position, it can be helpful to ask what someone needs to achieve the title of [insert dream job here]. This can provide concrete information. For instance, a recent graduate may learn he or she needs to work at the company five years before receiving a large promotion. Additionally, the graduate may learn that although he or she lives in New York, only the Chicago headquarters are seeking applicants for that particular job. When considering a big transition, it’s important to have a backup plan. What if the new job doesn’t work out? What if your current employer is upset that you might leave? How quickly can a person obtain alternative employment if necessary? It’s a good idea to have a plan B, and perhaps a plan C, just in case something doesn’t go well. This takes away a lot of anxiety and allows a recent graduate multiple options for continued and successful employment.